which were stolen from the Gnome Forest. Without the power of the Gemulets, the forest’s magic will die! Motivated further by the promise of gnome gold and equipped with enchanted gnome weapons, the kids will have to fight off strange new creatures, defeat monstrous bosses, and traverse all kinds of labyrinthine landscapes in their quest. 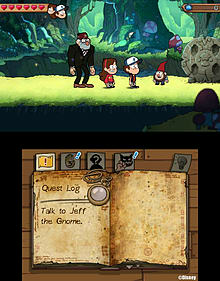 Meet characters like Soos, Grunkle Stan, Old Man McGucket, and others along the way in this fun action-packed game for all ages. 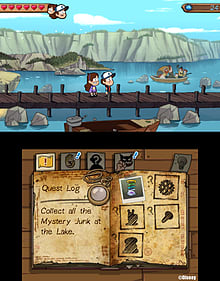 Gravity Falls: Legend of the Gnome Gemulets, powered by the acclaimed UbiArt Framework game engine, brings the look and feel of the show to Nintendo 3DS systems. Lush backgrounds and beautiful graphics allow you to explore your favorite places from the show, such as the Mystery Shack and the Gnome Forest, like never before! 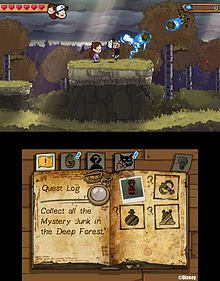 Dipper is bestowed with Gnome Battle Cuffs which deliver powerful punches at close range, and keeps his trusty flashlight by his side to shed light on the many mysteries in Gravity Falls. Mabel wields the Fleece of Bedazzlement that lets her whip her sweater sleeves to attack monsters from afar, and her grappling hook is at the ready to help access areas otherwise out of reach. 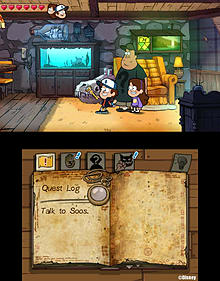 Defeat enemies, solve puzzles, and explore new and mysterious areas with teamwork and cooperation! 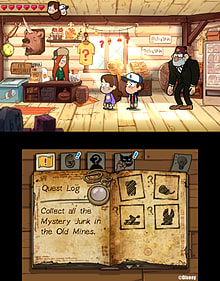 Creator and executive producer of Gravity Falls, Alex Hirsch, brings the show’s signature humor and fan-favorite elements to the game. 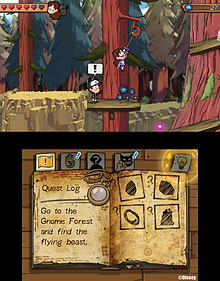 Involved throughout the development of the game on character design, artwork, story, and script, Alex has helped to create an authentic experience for fans.